When we moved into our 1908 farmhouse, I loved the charm so much. However, there was SO much dark wood. 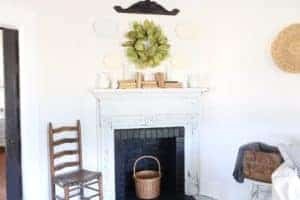 If you’re someone who would never paint it, avert your eyes for I’m about to share how I lightened the space on this Farmhouse Fireplace Makeover! There are many architectural details in this house and it’s one of the main reasons I wanted to move here. I saw the potential. But I’m a gal who loves paint and light and bright spaces. I decorated the mantel after moving in and lived with it for a while before deciding to paint it. Pretty right? But, it never really felt like “me”. It was so dark. I added that mirror on top because I saw it and fell in love. It added some great detail. But all that wood just darkened it even more. I decided to milk paint the wood to add that farmhouse feel. I started by cleaning it really well. Then I painted the brick with a flat black paint. I didn’t want glossy. It took only one coat for good coverage but had to do some touch ups after. I decided to use Milk Paint on the wood to get that chippy aged look. Miss Mustard Seed Milk Paint is so fun to work with. I had a few light colors that I mixed together as I didn’t have enough of just one. It took three coats total of the milk paint and let it dry completely and then began chipping away at it! That’s my favorite part of milk paint. You never know how it will look. You can add a bonding agent if you don’t want it chip but I never have. I like to live life on the edge. I sealed the wood with some clear wax and buffed it really well. You can also use Miss Mustard Seeds Hemp oil to seal and I’ve used that before as well. After everything was dry, I started added the decor pieces. 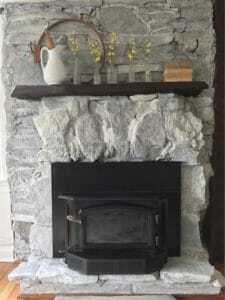 Everything I used for this Farmhouse Fireplace makeover I already had. SO this whole project cost me the $8 for the black paint since that’s the only thing I didn’t already have. Used my existing wreath to add texture. Shop your own house for decor to save money! I love how much brighter and lighter this room feels. 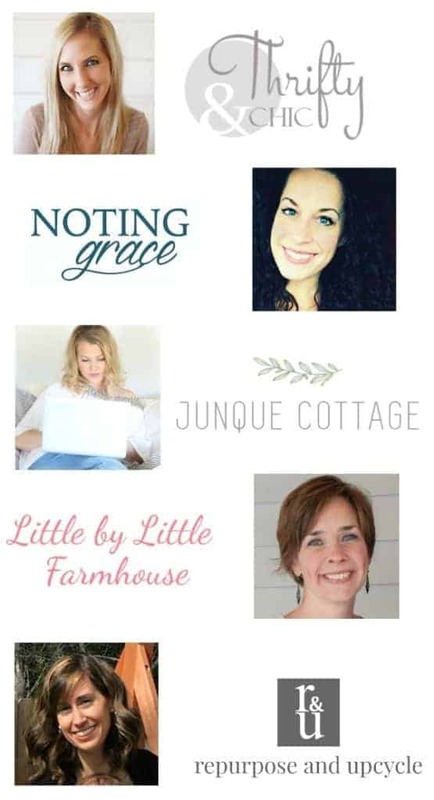 You can check out my farmhouse living room makeover here! 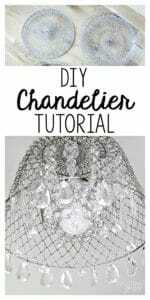 Jen shared how she turned trash into treasure with this easy DIY Chandelier. Lindsey shared how she updated her kitchen in a modern farmhouse style on a budget! Leigh showed us that it really is easy to whitewash a fireplace and this project can take the look of a room to a whole different level. Randi from A Fresh Squeezed Life shares this great tutorial on how to make your own Farmhouse Pillows. Rachel Joy DIYed her bathroom. We loved the shiplap and vanity. She is one you should definitely follow! This is a great transformation! I also like how you decorated the mantel. Beautiful contrast between the wreath and the ironstone. I love how you painted the fireplace! It looks like it fits in now! And that chair next to it really adds character! Fabulous job! ?? I love how you styled the baskets on the wall! Adds great dimension! 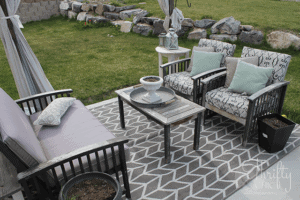 What a great makeover and the way you styled it is perfection! I love the new look. What a wonderful transformation………..it looks great….. So beautiful, thanks for linking up to Inspire Me Monday! Visiting here from the Bloggers Pit. This turned out so well! I love the new look! The fireplace makeover looks great. I know people shudder at the thought of painting woodwork but I agree with you. I like white and bright. Thank you Debra! I know so many people don’t love painted everything but I love lightening spaces with paint! Thank you Diana! Thanks for hosting! I love the painted fireplace! Beautiful transformation! Thanks for sharing at the Friday at the Fire Station link-up! Love how fresh it looks now Laura. Great transformation!! Thank you for sharing at Create, Bake, Grow & Gather this week. I’m delighted to be featuring this project at tonight’s party and I pinned it too. Oh my gosh! Thank you so much Kerryanne! !